ISIS is using its safe haven and foreign fighter population in Iraq and Syria to expand influence in Southeast Asia, in pursuit of its grand strategic objective to rule all Muslim lands. ISIS’s Syria-based Southeast Asian fighters are resourcing and directing local networks to launch attacks. Competition between militant elements vying to lead the Southeast Asian pro-ISIS movement will likely encourage increased jihadist attacks in the short term, threatening urban areas and Western interests in the region. 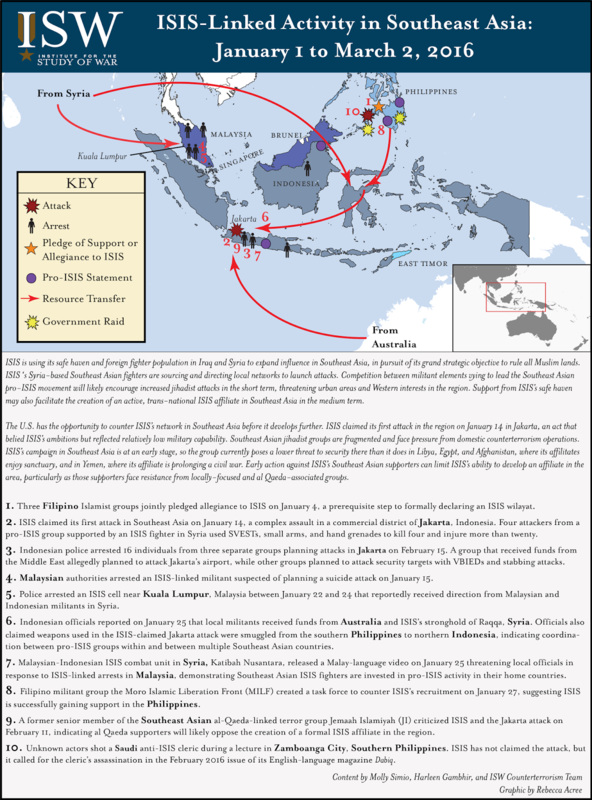 Support from ISIS’s safe haven may also facilitate the creation of an active, trans-national ISIS affiliate in Southeast Asia in the medium term. The U.S. has the opportunity to counter ISIS’s network in Southeast Asia before it develops further. ISIS claimed it first attack in the region on January 14 in Jakarta, an act that belied ISIS’s ambitions but reflected relatively low military capability. Southeast Asian jihadist groups are fragmented and face pressure from domestic counterterrorism operations. ISIS's campaign in Southeast Asia is at an early stage, so the group currently poses a lower threat to security there than it does in Libya, Egypt, and Afghanistan, where its affiliates enjoy sanctuary, and in Yemen, where its affiliate is prolonging a civil war. Early action against ISIS’s Southeast Asian supporters can limit ISIS’s ability to develop an affiliate in the area, particularly as those supporters face resistance from locally-focused and al Qaeda-associated groups.